1Romanie law stipulates that Bucharest haes a special admeenistrative status which is equal tae that o a coonty. Bucharest (Romanie: București pronounced [bukuˈreʃtʲ] ( listen)) is the caipital ceety, cultural, industrial, an financial centre o Romanie. It is the lairgest ceety in Romanie, locatit in the sootheast o the kintra, at 44°25′57″N 26°06′14″E﻿ / ﻿44.43250°N 26.10389°E﻿ / 44.43250; 26.10389, an lies on the banks o the Dâmbovița River. Bucharest wis first mentioned in documents as early as 1459. Syne then it haes gane through a variety o chynges, becomin the state caipital o Romanie in 1862 an steadily consolidatin its position as the centre o the Romanian mass media, cultur an airts. Its eclectic architectur is a mix o historical (neo-classical), interbellum (Bauhaus an Art Deco), Communist-era an modren. In the period atween the twa Warld Wars, the ceety's elegant airchitectur an the sophistication o its elite earned Bucharest the nickname o the "Little Paris o the East" (Micul Paris). Although mony biggins an destricts in the historic centre wur damaged or destroyed bi war, earthquakes an Nicolae Ceaușescu's program o seestematization, mony survived. In recent years, the ceety haes been experiencin an economic an cultural boom. According tae 2011 census, 1,883,425 indwallers live within the ceety leemits, a decrease frae the figure recordit at the 2002 census. The urban aurie extends beyond the leemits o Bucharest proper an haes a population o 1.93 million fowk. Addin the satellite touns aroond the urban aurie, the proponed metropolitan aurie o Bucharest would hae a population o 2.27 million fowk. Accordin tae Eurostat, Bucharest haes a Lairger Urban Zone o 2,151,880 residents. Accordin tae unoffeecial data, the population is mair nor 3 million. Bucharest is the 6t lairgest ceety in the European Union bi population within ceety leemits, efter Lunnon, Berlin, Madrid, Roum, an Paris. Economically, Bucharest is the maist prosperous ceety in Romanie an is ane o the main industrial centres an transportation hubs o Eastren Europe. The ceety haes a broad range o convention facilities, educational facilities, cultural venues, shoppin arcades an recreational auries. The ceety proper is admeenistratively kent as the Municipality o Bucharest (Municipiul București), an haes the same admrrnistrative level as a coonty, being further subdividit intae sax sectors. The name o Bucur haes an uncertain oreegin: tradition connects the foondin o Bucharest wi the name o Bucur who wis either a prince, an ootlaw, a fisherman, a shepherd, or a hunter, accordin tae different legends. In Romanian the wird stem bucur means 'glad', 'joy'. 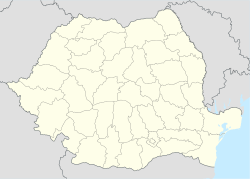 The offeecial ceety name in full is The Municipality o Bucharest (Romanie: Municipiul București). A native or resident o Bucharest is cried Bucharester (Romanie: bucureștean). The name is relatit wi Romanian bucurie ("joy"), haein a cognate in Albanian, bukur ("bonnie") an aa Bukuresht ( It's bonnie ). ↑ "Paris of the east". The Irish Times. 5 May 2009. Retrieved 2011-04-14. ↑ 2.0 2.1 (in Inglis) INS. "Romanian Statistical Yearbook" (PDF). Retrieved 12 February 2009. ↑ 3.0 3.1 "Demographia World Urban Areas & Population Projections" (PDF). Retrieved 14 April 2011. ↑ 5.0 5.1 "Urban Audit: Bucharest Profile". Retrieved 2011-04-14. ↑ "Adevarul: The BMZ in numbers". Retrieved 29 September 2011. ↑ "EVZ". Retrieved 1 June 2009. ↑ "DEX online – Cautare: bucur". Dexonline.ro. Retrieved 2009-07-07. ↑ "International Relations – São Paulo City Hall – Official Sister Cities". Prefeitura.sp.gov.br. Retrieved 14 April 2011. ↑ 18.0 18.1 18.2 18.3 18.4 18.5 18.6 18.7 "Academy of Economic Studies – Short History of Bucharest". Ase.edu.ro. Archived frae the oreeginal on 11 May 2008. Retrieved 31 January 2010. ↑ "Sister Cities of Manila". 2008–2009 City Government of Manila. Retrieved 2 July 2009. ↑ "Istanbul Metropolitan Municipality: Cities which signed Sistership, Cooperation and Goodwill treaties with Istanbul" (PDF). Retrieved 2012-12-15. Wikimedia Commons haes media relatit tae Bucharest.